Bramhall does plenty of good things, but ultimately Rich Man lands as a solid but slightly frustrating release. 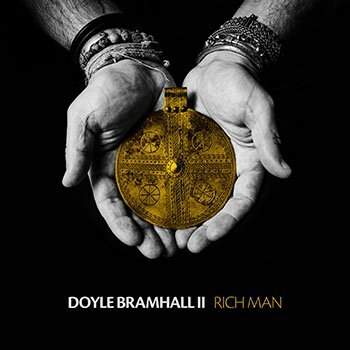 Doyle Bramhall II took almost 15 years between solo releases (working with artists like Eric Clapton, the Tedeschi Trucks Band, T-Bone Burnett, and Erykah Badu), and while new album Rich Man is a reminder of his strong talent, he should have taken just a little longer to finish this one. The album possesses a solid core: Bramhall reworks his blues-rock traditions along with some world music influences into something that touches on the Allman Brothers and Hendrix (the strong “Hear My Train a Comin'” performance) even while pushing out into something distinctly his own. But he needs an editor. The album contains long tracks adding up to a long album, with a sound neither diverse enough to be surprising nor focused enough to be a tight statement. Bramhall plays what he's been absorbing for all these years, but he'd have been wiser to make a shorter, direct album, or to go ahead and let those influences come out all over the place. The Indian influences on “My People” are just enough to hint at exoticism without actually creating a divergent feel. “Saharan Crossing” sounds like its name suggests but only serves as a stylistic experiment. Bramhall has the chops to do something radically different, but he's constrained himself inside his forms. “The Samanas” strives for an epic build, almost as a multi-part suite, but it never quite succeeds. Despite strong musicianship, this one could have been left out, or at least firmed up for another album, shortening Rich Man to a more digestible meal. It's a shame, because the album does contain a number of memorable tracks. When Bramhall settles into his comfort zone, he does what he does very well. Openers “Mama Can't Help You” and “November” ride R&B grooves while Bramhall takes a classy throwback approach to both his vocals and guitar playing. “The Veil” turns into a hard groove, properly restrained but expressive all the same. Bramhall's solo continues his lyrical case against relational subterfuge. Bramhall does stray with some success at one point. Norah Jones seems like an unlikely collaborator, but her vocals on “New Faith”, while they should be higher in the mix, lend extra heart to a Southern rock ballad. Bramhall never seeks the guitar god role on this album, but his ability to trust a simple melody and true harmony here allows for especially direct expression. Fans likely won't be disappointed with Bramhall's new offering (even seeing a solo release after all this time is good news). It is a shame that this album wasn't what it could have been. The album's best and most connected tracks would have made for a concise, potent release. The album's hints at experimentation suggest the possibility of either a second, out-there album or a more fully inventive version of this one. Instead, we don't quite get either, and Rich Man lands as a solid but slightly frustrating release.